For the last 26 years, from the day that we purchased our property, we have been religiously keeping daily rainfall records. It is just something that farmers do. The weather is never far from a farmers mind, and rainfall or lack thereof is always a topic for discussion. According to the Australia's Bureau of Meteorology our long-term yearly average is 433mm (17”). Our personal recorded average over the 26 years of records is 409mm (16.1”). These years do include the Millennium Drought during the 2000s, so called as vast areas of Southern Australia had the lowest recorded rainfall since European settlement, including our area. So what do the statistics look like? A fair bit of variation from year to year. 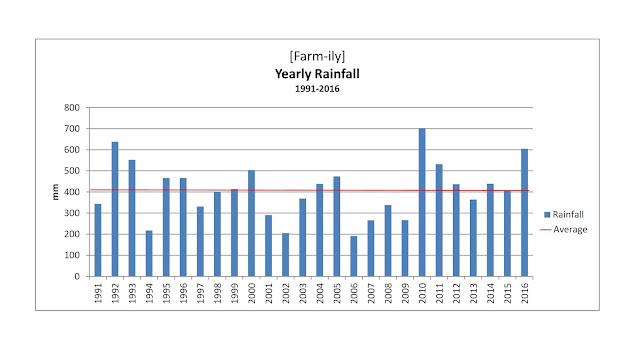 The lowest year was 2006 with just 191mm (7.5"), but it was followed by another 3 years of well below average rainfall. 2010 was highest year with 702.5mm (the 0.5mm are very important… they all add up!) which is 27.6". This was the year that broke the drought for us… the year that we all rejoiced. Here’s hoping for some good numbers in 2017. In Alberta, Canada , we average 13 in per year! Interesting to look at. I suppose it is not just the amount that falls but when. You are correct. Timing of rain is ultimately the determining factor as to whether the crop is a success or failure, not so much the total amount of rain. We are fortunate that we have irrigation to add to rainfall. Although this is a very expensive back up, and not always guaranteed, it gives us flexibility and some peace of mind. I love graphs...you can see the picture so quickly. I do hope you have good years ahead. Definitely hoping for good numbers and timing this year. And the years to come. Hope you have good rains at the correct time...good graph and the rain seemed to have evened it out over all. I have been thinking about that as the rain has continued to fall and we may have avoided another bushfire season here in the mountains (despite a recent spate of very hot weather) ... wondering when will the next inevitable drought be. You have really a lot of interesting information about many years. Great job keeping records for all those years and glad you got a good amount of rain last year. Hope this is a good one too. I just love your records. I'm sure those books hold the amazing story of your 26 years on the farmer as well. I love checking the rain gauge 1st thing each morning and if it is a heavy dump during the day I have to check it, but not empty it. I too keep a record, but its rather messy in comparison to yours. 2016 saw 740 mm and 2006 saw 561. The Brisbane dams were at 16 % then. I haven't been able to find what our yearly average should be. Looking at 2010, 11 & 12 it should be around the 1000 mm. I looked up on BOM - Brisbane average is about 1100mm depending on what weather station you look at, so you were very close with your estimation. I do love statistics and numbers so have always enjoyed the farm recordkeeping ie rainfall, financial, paddock records etc. The diaries are full of data, many sums trying to figure out how to make ends meet (specially in the early days), who phoned, who visited, jobs to do, birthdays, funerals, what was important on a particular day. There is also a lot of randomness from day to day! I wish we'd done that. My blog has a lot of that information, but I've only been doing it since January 2010. Years ago, there was a columnist at The Hutchinson News who was a farm wife. They kept records like that on their farm, too.